This monograph covers the development of such collectible items as ear trumpets, conversation tubes, and devices disguised as fans, walking sticks, artificial fruit and flowers  even the famous throne of King Goa VI of Portugal. Please note that this book is now out of print, though you may be able to obtain copies from The Hugh Hetherington On-line Hearing Aid Museum in the USA. 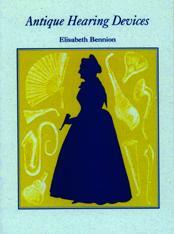 Elisabeth Bennion is the author of Antique Medical Instruments (Sotheby, 1979) and Antique Dental Instruments (Sotheby, 1986).